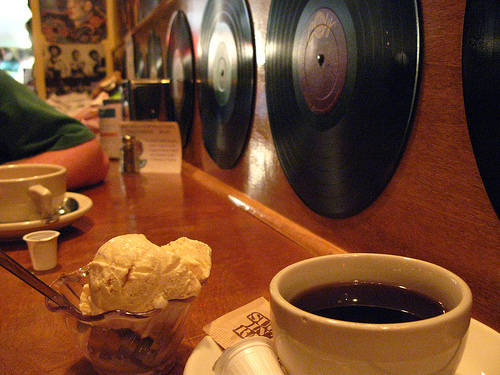 The Bus Stop Music Café is a charming little coffee house nestled in downtown Pitman. Every Tuesday night from 7pm to 11pm, the lights dim, and are replaced by the warmth of lava lamps and twinkling strands of Christmas tree bulbs. Vic Martinson, owner and operator, sets out a few microphones, an amplifier and a blank clipboard. 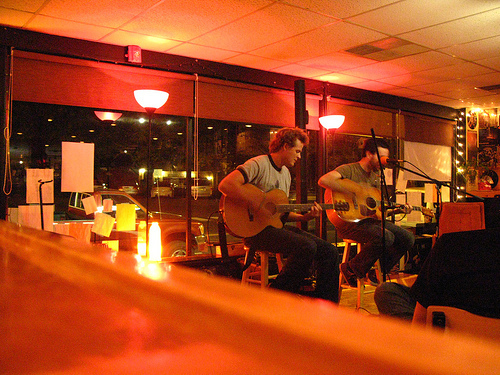 Over the next few hours, local musicians from all around will come to entertain customers at the weekly open mic, pausing only to enjoy some of the delicious drinks offered at the coffee bar. For a few brief hours the Café seems to exist as a cozy bastion, set apart from the rigors of everyday life, the inviting orange glow from inside drawing in weary travelers for a hot cup and some good tunes. The Café opened in late 2005, and after four years it has a strong group of regulars. 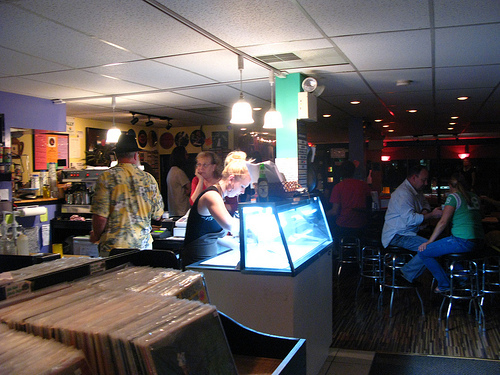 The atmosphere is comfortable, like a hole-in-the-wall bar without the cigarette smoke and the drunks. Seating is plentiful, and the café is filled with musical instruments of all kinds. Records and posters displaying imagery from every genre of music adorn the walls. This is mimicked in the variety of performers, who play everything from classic rock to emo, and 20’s blues to indie/soul. Bus Stop welcomes newcomers warmly, with a hearty round of applause and a quiet attentiveness despite the fact that the Café is packed. Listeners are respectful of the artists, keeping conversation to a whisper during performances, and offering nothing but encouragement at the end of each song. The coffee bar is joined by a full kitchen and a selection of gourmet ice creams, including seasonal flavors like pumpkin. A large compliment of organic products and Izze beverages are available as well, all at a very reasonable price. The back of the Café sports a small music shop, with guitar strings, tuners and other necessary supplies for the artist-in-need along with a fairly sizable selection of incense. They've got an impressive music selection and interesting coffees. 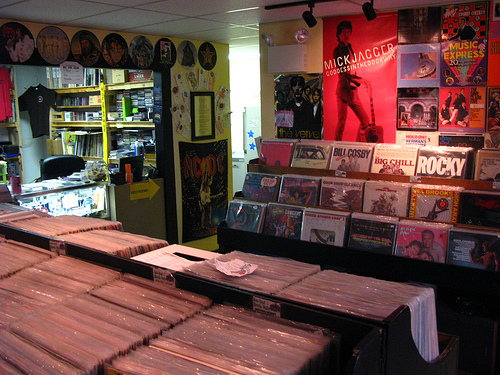 The main focus of the shop is the large music store set into the back corner. Bus stop has a veritable library of CDs, cassette tapes, and even old-school vinyl records for sale. They even have a special section dedicated to local artists. Anyone is welcome at the open mic, regardless of skill level, provided there’s nothing too profane in the music. Bus Stop is a family venue, so swearing and “adult” language are discouraged. While alcohol is not served on the premises, there is a B.Y.O.B. policy in effect. Bus Stop doesn’t have its own website, so for any more info about the open mic, or anything else concerning the café call them at 856-582-0009 or come in and ask. Questions are always welcome. This entry was posted on October 16, 2009, 5:54 pm and is filed under Reviews of Open Mics. You can follow any responses to this entry through RSS 2.0. You can leave a response, or trackback from your own site. looks like a nice venue! on a side note, how do i add a avatar next to my name? Hi, this is a cnmoemt.To delete a cnmoemt, just log in and view the post’s cnmoemts. There you will have the option to edit or delete them. Nice image! Now I recognize you from your twitter! I love funky multi-purpose venues like this — gives the performers some extra audience! What I love about a venue like this is that they make an effort to create a community, instead of just setting up some mics and monitors. For locations without websites, you are doing them a real service. On behalf of the undiscovered gems out there, I thank you. This is very nice, I’d love to visit this place sometime. The aura in the pictures seems so relaxing. I like this kind of environment. I love Bus Stop — more people definitely need to check this place out. This post will help! Gotta love the vinyl resurgence! And it seems only right that the venue would offer music from local artists, seeing as they are representing themselves live every Tuesday! The photo of the performers says it all: room to play, in front of windows, nice lighting. Perfect conditions! Any venue that has lava lamps and Christmas lights is my kind of hang-out. Basically, a bigger version of my bedroom. This is one cool place to unwind and relax. Nostalgia at its finest topped with hot and cold combo treats and warm crew. It was a must-try before we left the country. Hi there. I’m from South Africa and will be going to the States in 2 months’ times visiting our children in Philadelphia. They promised to take us to the little town of Pitman and we will definitely visit Bus Stop Music Cafe! Thanks , I’ve just been looking for info about this topic for ages and yours is the greatest I’ve discovered till now. But, what concerning the bottom line? Are you positive concerning the supply?|What i do not understood is in reality how you’re now not actually a lot more neatly-appreciated than you may be right now. You are so intelligent.